Sure to be a favorite! Our Bling Key Necklace is beautifully wrought with dual heart shapes, covered in bling and hanging on a most exquisite chain. Snap in any of our hundreds of beautiful Dots to create an even more stunning look. A great gift from a realtor to a new home owner. Also wonderful for a man to give his lady just as they are falling in love. Represents the key to his heart ❤️! This necklace is a Client favorite! It’s a must have! You will love the Corena chain on this necklace. Heavy duty chain but super light weight! This is a beautiful foundation piece. The chain is gorgeous - need to add to my Bling collection! 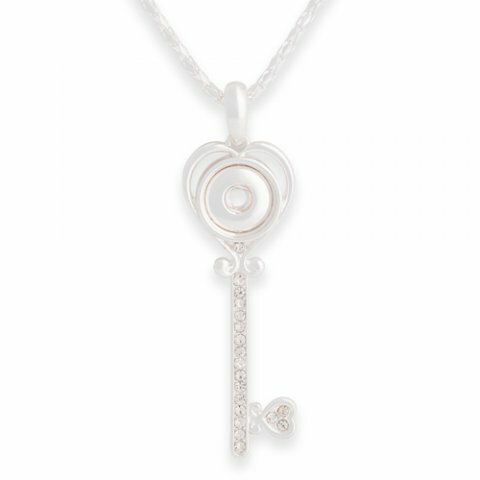 This Bling Key Necklace is a perfect go-to long necklace. I love the Coreana chain. It catches the light and shines like diamonds. It should be the key to your loving, blingy heart.